Combine indoor and outdoor living spaces seamlessly with the addition of a patio from Outside Concepts. The addition of a patio not only extends your living space, it also allows for outdoor entertaining and relaxing all year around. Protected from all weather conditions by way of a solid of transparent roof – depending on the amount of light you prefer – patios can be used as a dining space, outdoor kitchen, play spaces for young children or simply a quiet space to sit and read the morning newspaper. Get just the right amount of shade and sunlight with a gable patio. With an almost barn-like roofing, Outside Concepts offer gable patios with solid, transparent or combination roofing. The high, sloped roof offers plenty of cover and shade, so furniture can be placed under patio without risk of damage. Meanwhile, fans can be easily installed for the warmer months. For a more sleek, contemporary style, opt for a patio with flat roofing. The lower roofing make this a suitable option for one storey houses, but this style is easily customisable. Choose from a range of materials to suit your existing home and the intended use for your outdoor space. Timber can evoke the look of an island resort, whilst a semi-transparent roof will make for a slightly shaded outdoor sun room. Outside Concepts specialise in custom designing patios in a wide variety of styles and designs to suit all homes and budgets. Our portfolio features many more alternative designs. Wondering what the difference is between a pergola and a patio? At Outside Concepts we generally consider a patio as a covered outdoor area with a roof, usually with direct access to the house. It is worth noting patios usually provide a rear entrance to the house. 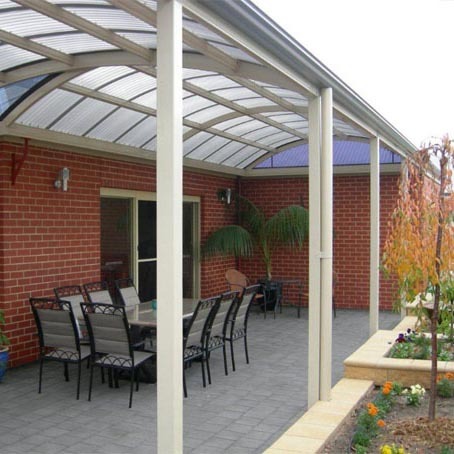 Meanwhile, pergolas are shaded or roofed areas usually placed in the middle of a leafy garden. Get in touch with the outdoor living specialists at Outside Concepts for advice on the best designs and materials you need to transform your outdoor space.